I have been very interested in teaching and pedagogy since I was an undergraduate and took two semesters of percussion pedagogy which even included supervised teaching of high school beginners through the conservatory’s preparatory department. In 1993, when I found reading pitched music to be such a challenge for many high school and college percussionists, I began working on the etudes and materials for this book, which is now in it’s third edition and has been used by thousands of drummers to learn to read and to get prepared for college auditions. It is based on learning the major scales and using scale based speed reading techniques. It has been very successful and I was paid the ultimate compliment from Mitch Peters who told me during a phone conversation that he thought it was such a good idea that he used scale based melodies in his own method he was writing for Alfred. It is so important for young percussionists to learn to hear functional harmony and to play melodically with good phrasing. I have always drawn on lute and classical guitar music for much of my teaching and I put my favorites into an anthology for others to use in teaching beginning four mallet marimba. The music is in the beginning, intermediate and advanced intermediate levels and is drawn from the Renaissance, Baroque, Classical and Romantic musical eras. While I published this book in 2001, there has recently been a move toward using transcriptions in the educational field and this year one of the etudes in my book was selected as the Texas All-State four mallet etude! In 1995 when I recorded the music on this CD, there were NO commercial recordings of a professional musician with a high quality instrument performing student level repertoire so young players could hear how their music should sound. I felt this was a huge need in the available teaching methods and resources at that time and decided to invest in this project. Since it’s release in 1996, I have sold more than 2,000 copies of Prism, plus more than 10,000 digital downloads & streams of selections from it. The biggest hit, of course, is Yellow After the Rain which is continuing to be heard several times a day globally! My most recent project is a sixth grade percussion class method book. It is based on teaching aural skills and keyboard percussion at the same time as snare drum technique, using the traditional school bell kit. This book is a result of my decades of teaching experience, research and my own experience going through the violin Suzuki method and has been in development in local middle schools for six years. Expected publication in 2017. 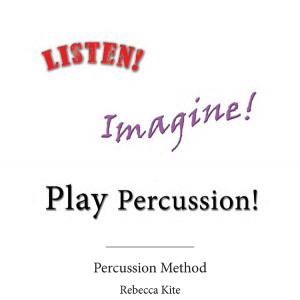 For the past two years I have been working on a research project that includes getting ideas and feedback from PAS members about percussion pedagogy – specifically, teaching from the 6th grade through senior high school level. 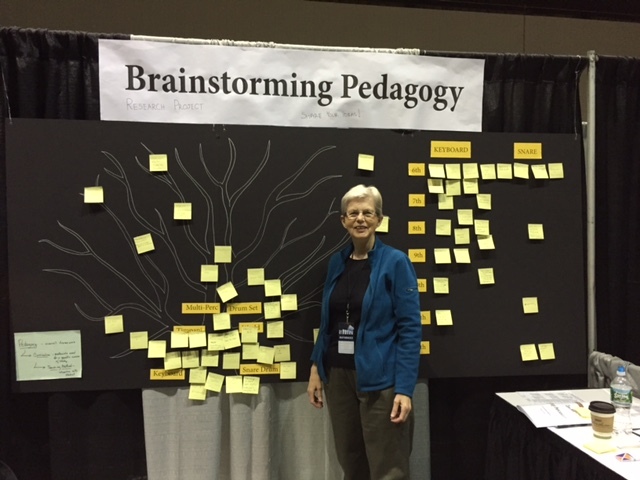 In a booth at PASIC, I invited people to put their ideas up on the board on a stickie note. The first year subject was finding commonalities between seemingly opposite instruments (like keyboard percussion and drum set for example – the commonality being hearing harmony and form). The second year was building a pedagogy tree – placing important techniques in their proper place on the tree – in the trunk if it is used in all percussion instruments, out in the branches if it is used in specialized situations. The final result of this research will be a seven level framework (which can be seen on the right side of the tree in the photo) to guide teachers in their curriculum to ensure that a student who wants to major in music in college will have learned all the elements of performing percussion, aural skills, theory knowledge, and reading and are fully prepared for academic success.